Water touches many aspects of your home every day for laundry, dishes, bathing, cleaning, cooking and, of course, drinking. That is why it is important to take water quality seriously. Our Evolve series softeners are engineered to provide the right answer for your needs. With advanced technology and eco-friendly features, you can enjoy the peace of mind that you're bringing the best system into your home. 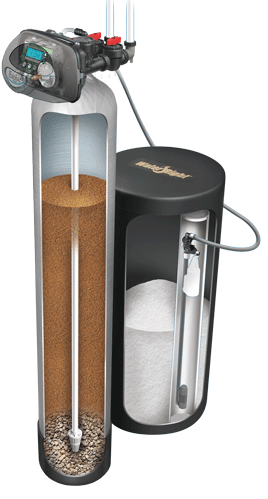 Interested in a water softener for your home? 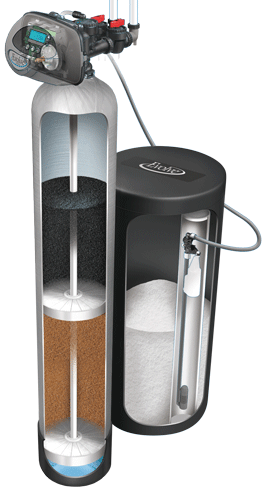 Contact us today or read on to learn more about our different water softener options. We also offer free estimates in De Pere, Neenah, Grand Chute, Little Chute, Greenville, Kimberly, Fond Du Lac, and nearby areas of Wisconsin. 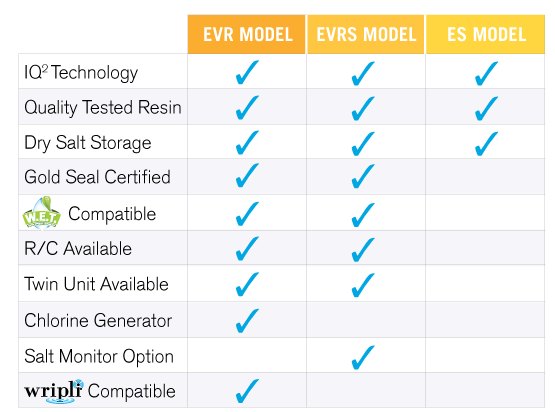 The EVR model is our most advanced water softener. Equipped with a high-performance resin, it effortlessly reduces even the toughest hardness minerals. Our patented chlorine generator is included on EVR models to provide an automatic cleaning cycle to your system. The advanced electronics are compatible with Wripli, our convenient WiFi technology, and Water Efficient Technology for maximum savings. This top of the line model has many different configurations to choose from. 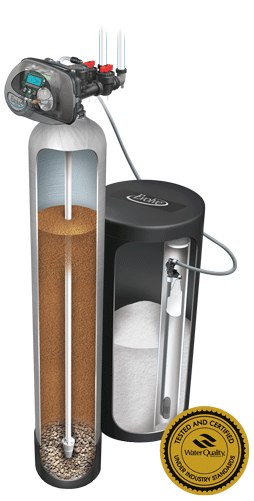 The standard resin unit is perfect to handle hard water issues. The EVRC has a dual-chamber tank to hold both resin and carbon, which filters unwanted tastes and odor while softening. The standard and dual-chamber options are also available as twin units for efficient around the clock treatment. EVRC softeners utilize split tank technology to safeguard your plumbing while still eliminating unwanted taste and odor. This makes it the perfect solution for dealing with the odor and taste problems that often come from city water. It can also be equipped with Water Efficient Technology to greatly improve its water and salt efficiency. The EVRC also boasts a variety of adjustable settings to further help reduce salt and water use. EVRS water softeners are the smart choice. Using the same quality resin as the high-end EVR, you can trust the system's performance of reducing hardness in your home. It can also become the most efficient system on the market when you equip Water Efficient Technology to save up to 50% of salt and water used. Our EVRS softener has a lot to offer. It can be purchased as a standard resin softener, a split-tank resin/carbon softener capable of filtering and softening at the same time, as well as twin units for around the clock soft water. Modern homes need softened water. Hardness minerals build up in your plumbing and high-efficiency appliances reducing their effectiveness. Investing in a water softener will help protect the life of your home. Developed with the same advanced engineering as the more advanced models, the ES is a dependable unit needing little maintenance. The high-performance resin provides hardness removal you can count on for day to day soft water. Improve the quality of your home's water with a water softener and a free estimate! Water-Right's Clean Water Center offers a wide range of different water softener options. No matter what your particular needs or budget, we have a water softener that will be perfect for your home. Contact us today online or by calling 1-866-450-0116 in order to schedule your free estimate in Appleton, Green Bay, Oshkosh, or nearby Wisconsin!